T cells can also be known as effector T cells, which can be applied to any subtype of T cell and simply means they are ready to respond and are responding to a stimulus. As illustrated above the different T cell subtypes have distinct functions in the immune response against infection. Naïve CD4+ begin to differentiate as a result of antigenic stimulation through the interaction of the TCR and CD4 co-receptor with the antigen-major histocompatibility complex class II (MHC II) presented by antigen presenting cells (APC), such as dendritic cells or macrophages. The activated CD4+ T cells differentiate into lineages of T helper cells, each with distinct biological functions. The lineage-specific differentiation depends on the cytokine milieu of the microenvironment, the type of APC, and the co-stimulatory signals provided by the APC during activation. These differentiated T helper cells play key roles in coordinating the adaptive immune response by activating and directing other immune cells. They primarily secrete effector cytokines that target immune cells to orchestrate a synchronized immune response. 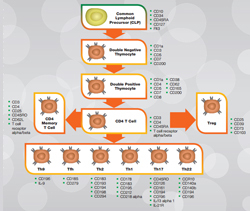 To learn more about CD4+ T cell subsets, download a copy of our guide which provides a quick snapshot of the function of each T helper cell, as well as their biological profile. You can also access antibodies for studying these cells. The guide is intended to help you quickly identify the key information needed to design experiments to study these critical immune cells. 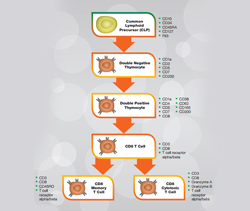 Detailed information can be found here about anti-CD4 clones and their recommended applications, along with the antibodies available. The defining feature of T cells is the expression of the T cell receptor (TCR) on the surface of the cell. TCRs are highly variable so that they are able to recognize different antigens. TCRs are unable to bind antigen directly, the antigen is broken down into peptides and presented to the T cell by antigen presenting cells (APC) such as dendritic cells and macrophages. It is the major histocompatibility complexes (MHC) on the APC surface that hold the antigen/peptide and present it to T cells. MHC class I present to cytotoxic T cells and MHC class II present to helper T cells. For T cell activation to take place, in addition to the TCR binding to antigen peptide presented by MHC, simultaneous binding to a co-receptor molecule is required. CD4 is the co-receptor expressed by helper T cells and CD8 is expressed by cytotoxic T cells, these co-receptors help stabilize the TCR-MHC complex. Further to the MHC-TCR and co-receptor binding co-stimulatory molecules are required for effective T cell activation which then results in the instigation of various signaling pathways. For example co-stimulatory receptor CD28 on the T cell binds to proteins such as B7-2 or B7-1 on APCs. Read our TCR mini-review for detailed information on TCR activation, signaling, development and diversity. The TCR is composed of chains that are required in the transmission of the signal to the T cell. These chains can either be alpha and beta or gamma and delta. The majority of T cells are composed of alpha and beta chains, like those found on CD4+ helper T cells and CD8+ cytotoxic T cells. Gamma/delta TCR T cells form a small separate subset of T cells with their own set of specific features and functions. For efficient signal transmission through the TCR a further co-receptor is required. This receptor is composed of various epsilon, zeta, delta and gamma chains. When complexed around the TCR this co-receptor is known as CD3. Read our CD3 mini-review for further detailed information about CD3 including its structure alongside that of the TCR, the genes involved in its expression, its function and the signal transduction pathways mediated by CD3 complex, or click here to view antibodies against this important T cell marker. T cells are predominantly produced in the thymus; some T cells however mature in the tonsils, hence the name T cells. T cells originate from hematopoietic stem cells, which after several stages of development result in a common lymphoid precursor. It is at this stage of development where B, T and other lymphoid derived cells branch out into separate lineages. T cell development continues through the development of double negative and then double positive thymocytes following on from which the different T cell subtypes arise. Figure 1 below shows the T cell lineage of human helper T cells and cytotoxic T cells alongside key markers for the different stages of development. For further information on T cell development in humans and also in mouse refer to our collection of posters and guides. Fig. 1. Human helper CD4+ T cells (a) and cytotoxic CD8+ T cells (b). 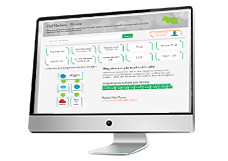 Click on the T cell lineage to view human lineage posters and guides. Mouse lineage posters and guides are also available. Bio-Rad provides a comprehensive range of antibodies for T cell research, either search for these using the filter table below or by entering your marker in the search box at the top of the page.